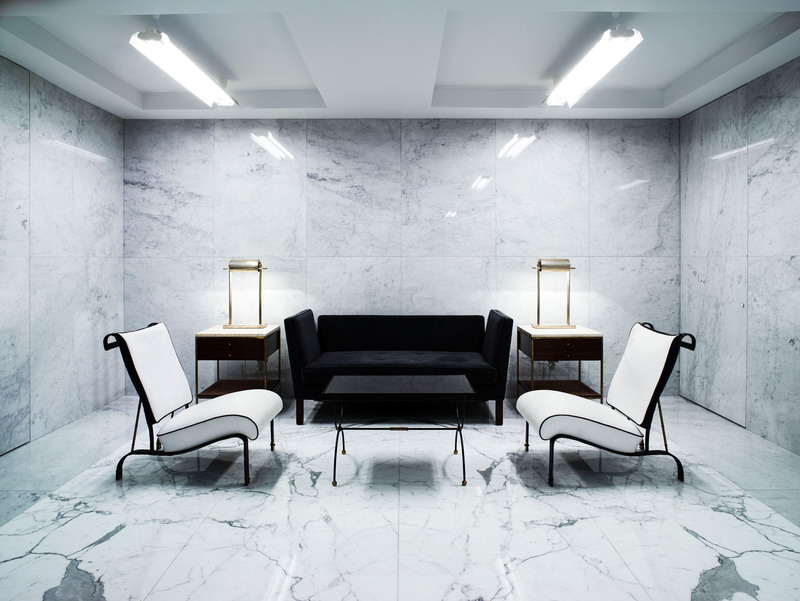 Thom Browne is known for his evocative set designs. The blue-and-white–striped wood huts decorated with American flags and lifeguard towers that were erected on the runway today called to mind Nantucket’s sandy shores. Browne isn’t the only one yearning for the beach this season, though his preppy landscape was far removed from the bohemian escapes we’ve seen conjured thus far. Still, nothing in this designer’s world is quite what it seems. He twists and turns cultural references through the labyrinth of his imagination to spectacular effect. Men in pleated skirts and pointy gnome hats were the first to populate Browne’s Spring fantasyland, eliciting smiles from the front row as they distributed colorful gerbera daisies. The collection then unfurled with a parade of wildly glamorous and absurdist nautical looks. Browne’s signature grosgrain-trimmed flannel suit was reconfigured as a gold sequin–encrusted mermaid dress and matching cropped jacket, complete with trompe l’oeil oyster shell bustier and dramatic tulle fishtail. The collage techniques he’s been developing lately were taken to a couture-level conclusion via recognizable prepster tropes—seersucker, gingham, whale and anchor motifs—that were rendered in every luxurious fabrication you could possibly think of, then spliced, diced, and reassembled with whipstitching. The resulting Frankenstein pieces were both meticulous in their brilliance and demented in their proportions. 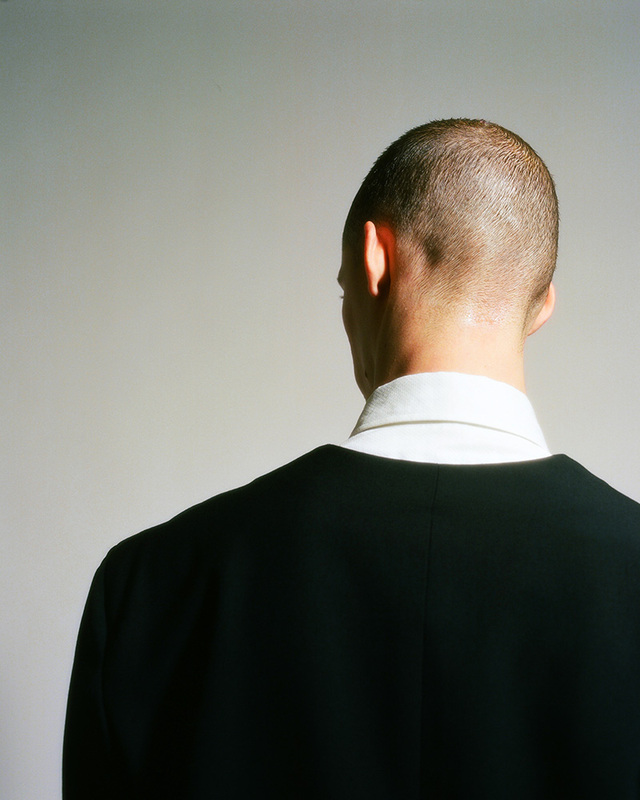 Browne is a provocateur by nature, and pushing the performative boundaries of fashion is just as important to him as advancing the awe-inspiring technical aspects of his work. 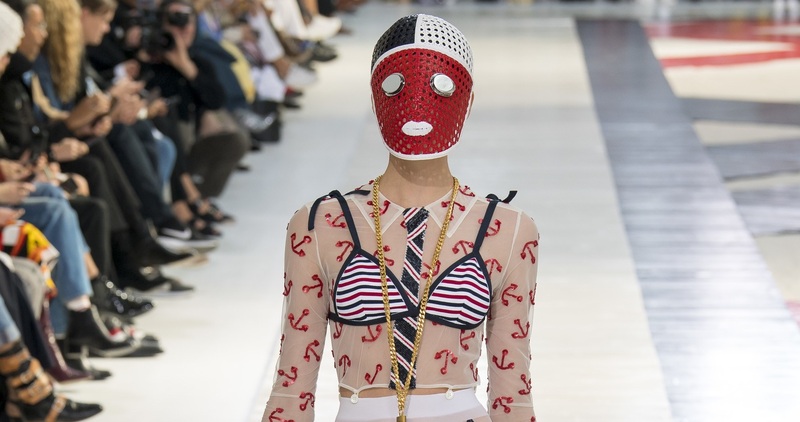 He recast the most innocuous signifiers of summer—beach balls, watering cans, ice cream cones—as Friday the 13th–style face masks, lending an ominous undercurrent to the collection. It was hard not to feel unsettled by the jackets and coats that had models quite literally trussed up in fraying silk and tulle, as if they’d been washed ashore in tangled yet exquisite fisherman’s nets. And perhaps that was the point. 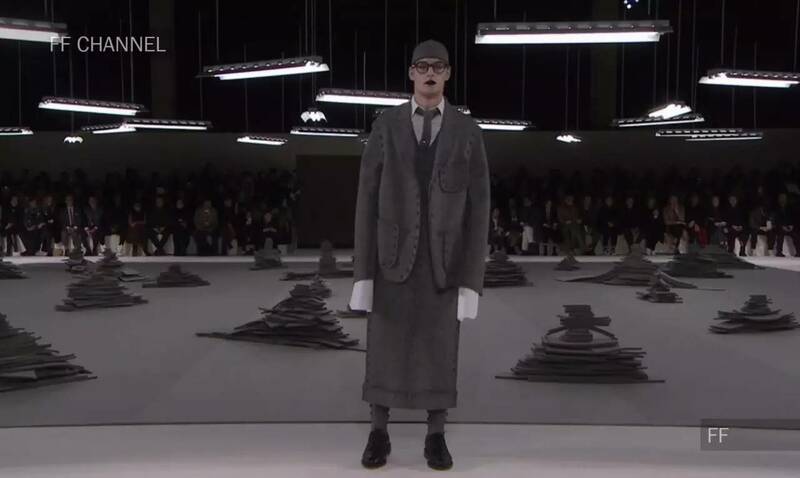 Browne’s dreamiest fashion reveries tend to be a complex web of the beautiful and the terrifying. 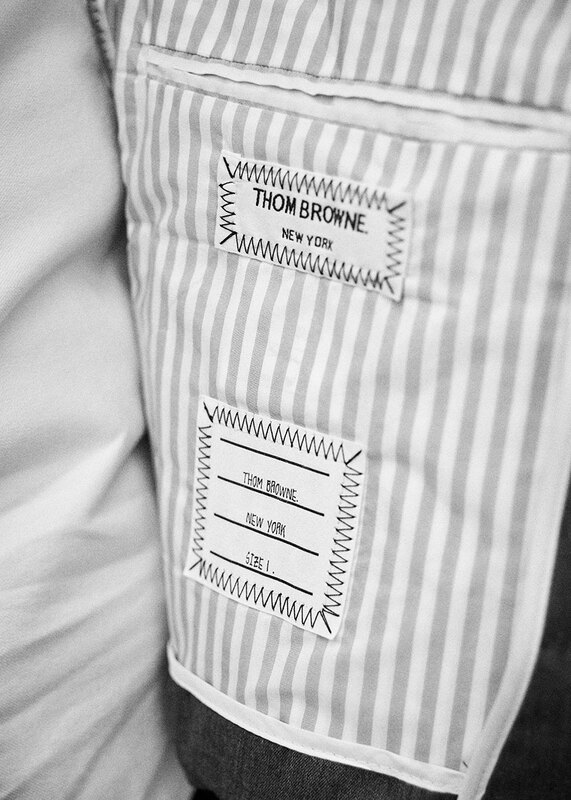 Indeed, it often seems as if he intentionally undermines the overt prettiness of his clothes, perhaps in order to deepen the personal fantasy that defines the Thom Browne experience. Whichever way you choose to interpret the elaborate styling and staging of the show, it is difficult to imagine a street/boardwalk/universe fit for Browne’s death-defying, mismatched shoes. 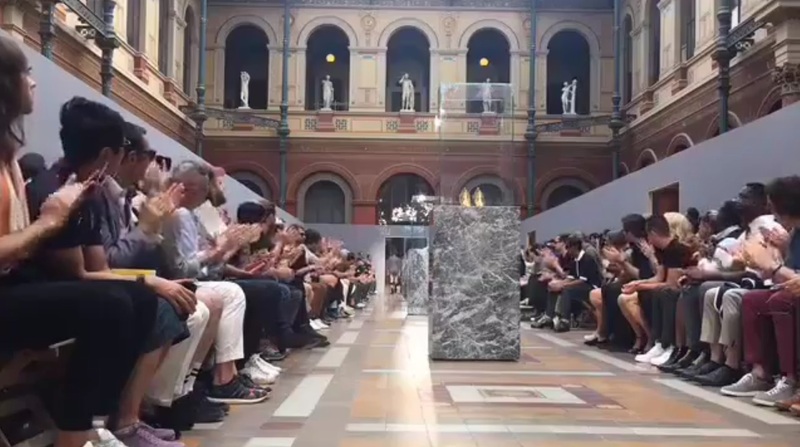 It was painful to watch the models hobble down the catwalk at a snail’s pace, the fear that they might fall intensifying with each slow step. That long-held fondness for killer heels no longer holds water on the runway, let alone in the real world. His dazzling, one-of-a-kind designs would stand just as tall without them.